I knew Monday, that this would be a lazy cooking week. One of the best things about stocking up at Trader Joe’s is how easy and guilt free it is to cheat a little! I bought some beef-less and chicken-less strips. Last time I used the chicken-less, I was disappointed in the spices, but I was cooking a delicate Chinese dish. I wanted to go ahead and try some southwestern food with them this time. And they fit perfectly just like I had hoped. fixins: sour cream (or tofu substitute), lettuce, salsa, etc. Heat up a non-stick pan and add the onion. Sauté until it is almost translucent, then added the pepper strips. A couple of minutes later add in the chicken-less. Once the chicken-less is heated through, removed the pan from the heat, arrange 4 taco sized tortillas over the contents and cover with a lid to steam and warm the tortillas. Remove the tortillas and place ‘clean’ side down. Now spoon in chicken-less mixture and top with your favorite salsa and taco extras. I hope you enjoy it as much as I did. I also served up some refried black beans with red jalapeno from whole foods. Bur be careful, they were hotter than I expected! There was a great film festival in Durham this weekend. If you get a chance see Ready? OK! It’s about a little boy that wants to be a cheerleader. It has the actor that plays Ben from Lost in it, as well as, the most amazing new child actor. It was well made, and a feel good film to boot! Saturday: Grill veggies and burgers? Have a great menu planning day! First off, if you got here from FatFreeVegan, a big hello and welcome to you. And if you’re here from somewhere else hello to you too! I’m so excited that Susan put a link to my site on her blogs she likes list. It makes me feel all giggly and warm inside. She is one of my cooking heroes! I’m a huge Turtle Mountain fan, especially their fruit sweetened soy ice creams, and to me they taste less ‘beany’ than their regular ones. But give me one of their ice cream sandwiches, and you won’t hear a complaint from me! When I saw coconut milk based ice cream from them, I was ecstatic. I love coconut milk. It’s so creamy and rich. In fact, I made some homemade ice cream with coconut milk this summer and it turned out pretty good. But they’re ice cream experts, unlike me, so I had high expectations. Let me tell you now that I was not let down. I tried the coconut flavor. It’s sweetened with agave nectar, which is another plus in my book. It is 170 calories for 1/2 cup with 10 grams of fat, so don’t sit down and eat the whole thing. Compared to the fruit sweetened raspberry mango that has 110 calories and 1.5 grams of fat per 1/2 cup serving, the coconut milk based one is defiantly an indulgence. Eating it I certainly felt indulged. Super thick and full of coconut pieces, it would fool any dairy eater. It doesn’t feel like a substitute for anything, it’s great in its own right. But don’t just take my word for it, print out a coupon and go try one of your own! You will have to fill out a form first, but you get coupon links for their yogurt as well as the frozen products. I saw they are making coconut yogurt as well, I can’t wait until it comes to my area. Now all I need is someone to make almond yogurt too. I even cooked a few things ahead of time! Yesterday I made 2 breads, 2 main dishes, and cooked up some bean to boot! I was lazy last week. Ok, so I was lazy this week too! And that means I have some veggies that are teetering on the verge of being compost worthy. I bought a few pounds of “ugly” tomatoes at the farmers market last weekend, and they were ready to use then. Ugly tomatoes are the best bargain at my market – 1.75 a pound instead of 3.00 a pound. And they’re heirloom ones to boot! My plan is to throw together a big slow cooker of yummy pasta sauce. Since it’s not going to last as long in the fridge, I’m going to freeze them in serving portions. 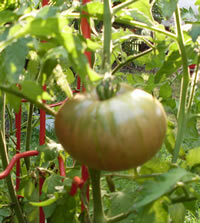 Then I can have some heirloom tomato sauce on my pasta in the fall and winter too! Throw it all in together. Or you can get all fancy and sauté the onion, peppers, and garlic first. I’m planning on cooking the heck out of it. I’m going to cook it overnight on low and see if it needs to go a little longer. If it does, I’ll alter this post accordingly. Once it looks close to done I toss in my fresh herbs and/or pesto. If you are using dried herbs go ahead and put them in with everything else. As always flavor to your liking, and taste throughout. No one knows what you like better than you! Yes, it’s time for another menu plan. I’ve been extra busy the past few weeks and not planning my menu has taken a toll. We ate more junk and spent too much money eating out. So now it’s time for me to get back on track. Monday: Pizza on homemade whole wheat pizza shells with pesto and kalamata olives.